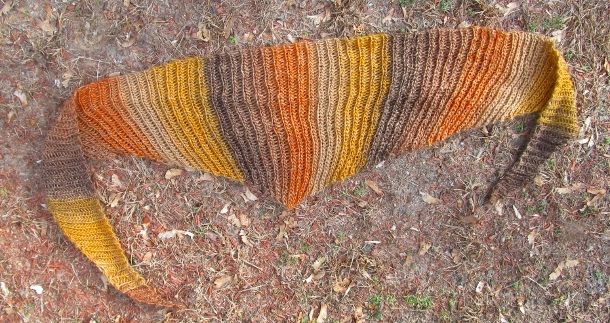 Worked side-to-side, the Sunrise Slip Stitch Shawl is long and narrow with tapered ends ideal for tying or wrapping. It is easy to customize with different yarn and hooks; just work the increases until your shawl is half the width you would like, and then begin the decrease section! This yarn has been discontinued. An appropriate substitute could include Bernat Mosaic, Noro Kureyon, Hobby Lobby I Love This Yarn! Stripes, Lion Brand Amazing, Red Heart Super Saver, or any other smooth, worsted weight yarn. Gauge: Gauge is not significant in this design. 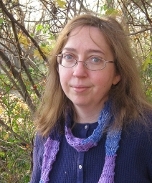 This pattern can be worked in any yarn, in any gauge, made to any finished size. Concentrate on keeping your slip stitches an even size: it’s very easy to start tightening them up! 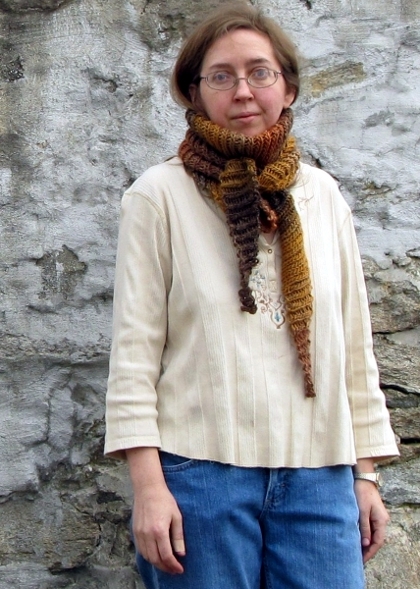 Note: Want to use up your entire skein? To find out when to begin your decreases, weigh your skein before you begin and periodically as you work. When your skein reaches half of its starting weight, begin decreasing for a perfect finish. Row 4: Ch 1 tightly, turn. Sl st BLO in each sl st across row, ch 1 loosely (counts as new sl st, stitch count increased by 1). Row 6: Ch 1 tightly, turn. Sl st BLO in each sl st across row until last 2 sl st. Skip next st, sl st BLO in final sl st. (Decrease made, stitch count reduced by 1). Repeat rows 6 & 7 until 3 stitches remain. I am so looking forward to crocheting this pattern!! so glad to see someone using slip stitch. i made my mother in law a slip stitch winter hat. bright red! she loved it. i really love the fall colours of your scarf!